Urbano Rodriguez may well be a genius, at the very least he is a master of design. His range of geek and gamer engagement ring boxes are some of the coolest we've seen. This is how to impress when it comes to your proposal, imagine whipping out a 3D printed Game of Thrones style Dragon egg and cracking it open to reveal the ring as you pop the question! 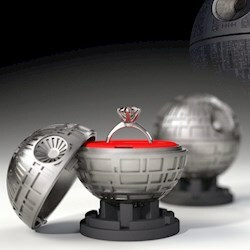 Other designs include a Portal Companion Cube, Star Wars Death Star, Pokeball and an X-Box ring box! You can also grab a nifty little stand if you want to put your box on display either at your wedding or in your home.